Welcome to D&H Insurance, LLC! Providing you and your family with the insurance products and services that make life easier and safer has always been the goal and practice of Daniels & Howe Insurance Agency. When life’s big events or setbacks occur, we’ll be there with strategies and a firm commitment to your peace of mind and security. 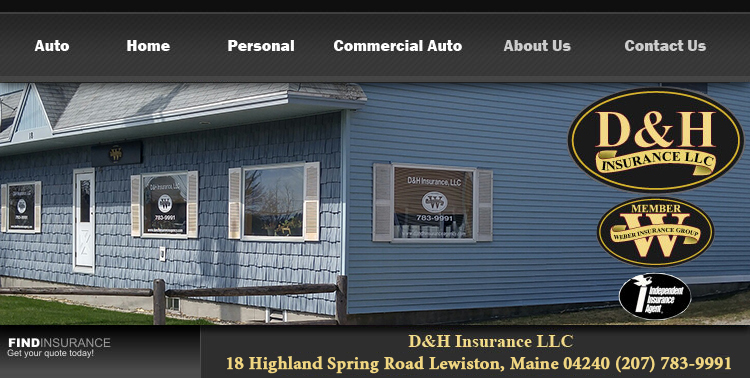 D & H Insurance Agency is an independent insurance agency "specializing in customer service". We offer name-brand insurance policies for auto, home, Boat, RV, Umbrellas and Life Insurance; from the most basic to very comprehensive. We also offer Business & Commercial insurance including; Commercial property, General liability, Workers compensation, Contractors insurance. All tailored to fit your specific insurance needs. Our Independent Agent status provides us with the unique ability to go the extra mile in finding the best coverage at the best price... in order to meet your particular insurance needs. By having choices with over 20 of the nation's top carriers in the insurance marketplace, we can provide competitive pricing to you without sacrificing coverage or service. Our primary objective is to establish a relationship, a partnership, between you and our professional staff. We want to earn your loyalty through successful service-related partnerships. Your satisfaction depends upon us providing you with excellent claims guidance, first-rate risk control expertise, and the superior customer service that you deserve. We strive to make buying insurance a positive experience. You can count on D & H Insurance for the most comprehensive insurance with the most competitive insurance rates available, not to mention fast, responsive quote processing. We welcome you to explore our site or contact us to learn more about our personal and business insurance solutions and find out all that D&H Insurance can do for you.